Tiny 1 bedroom cabin, just down from White Sands Apartments and 1 back from the beach. Sleeps 2 with guests. There’s a day bed in the bedroom suitable for a child. This little gem is perfect for Families. Plenty of room for boat parking. 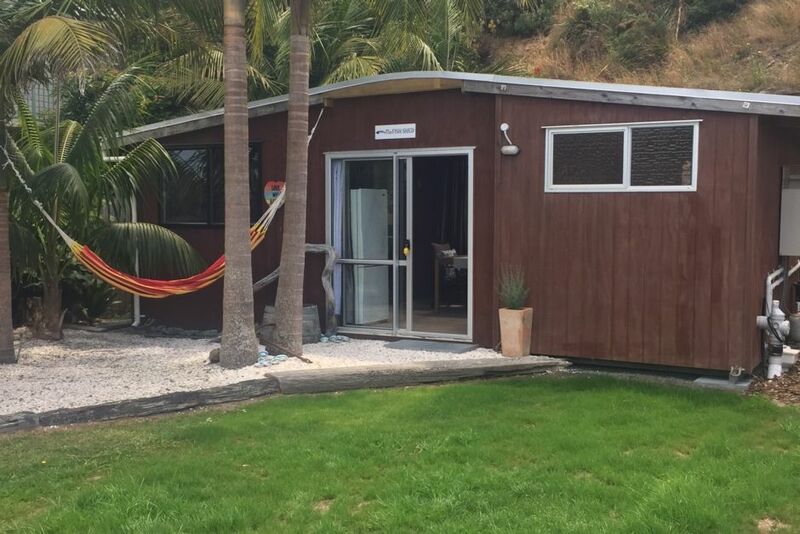 Close to Carrington Resort and Winery, Matai Bay and Puheke Beach(surf beach). This is very close to the beach, safe swimming and fantastic fishing. Includes linen. Bath towels, not beach towels. Dishwasher, microwave, bench oven, Nespresso machine, old school bbq, outdoor area, fish bench, fishing gear storage and seperate bait\fish fridge. Rangiputa is one of the most beautiful beaches with white sand and the clearest water. Proximity to the beach is what makes The Fish Shed appealing. It was our pleasure, so glad you enjoyed your holiday. Look forward to seeing you again. Lovely property only a short 30sec walk to the beach. Clean, tidy and safe and secure. Would absolutely love to stay here again. Great place - loved every minute at fish shed. So happy you enjoyed your stay. Quirky, small, clean, comfortable bach near the beach. Quirky, small, clean, comfortable bach near the beach. Quiet location, great base for exploring the Karikari Peninsula. Great to hear you enjoyed our beautiful part of the world. Fantastic litttle Bach, near the beach, well equipped, spotlessly clean and loved the artistic decor. Rangiputa is a gem of a place and for a cosy Bach near the crystal clear waters, this is perfect place with lovely owners. It truely is a gem, we are so happy to share. Very comfortable beach accommodation. We enjoyed our stay there and would happily return for another visit. You certainly had some lovely weather and the swimming is devine. We would love to have you back anytime.